May Jobs: Another solid month; Lowest black unemployment rate on record; Wage growth ticks up for mid-wage workers. Given the noisiness of these monthly data, our patented jobs smoother looks at average monthly employment gains over 3, 6, and 12-month intervals. 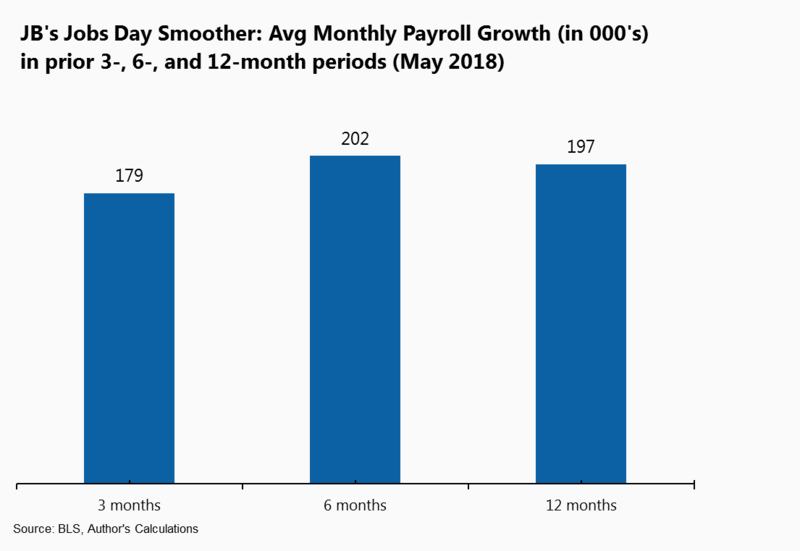 As shown below, the trend in payroll growth is running at around 180K-200K per month, a solid trend that, if it persists, is strong enough to continue pushing down the unemployment rate. I recently pointed out the prime-age employment rate is a better predictor of recent wage growth (nominal, i.e., before inflation) than the unemployment rate. 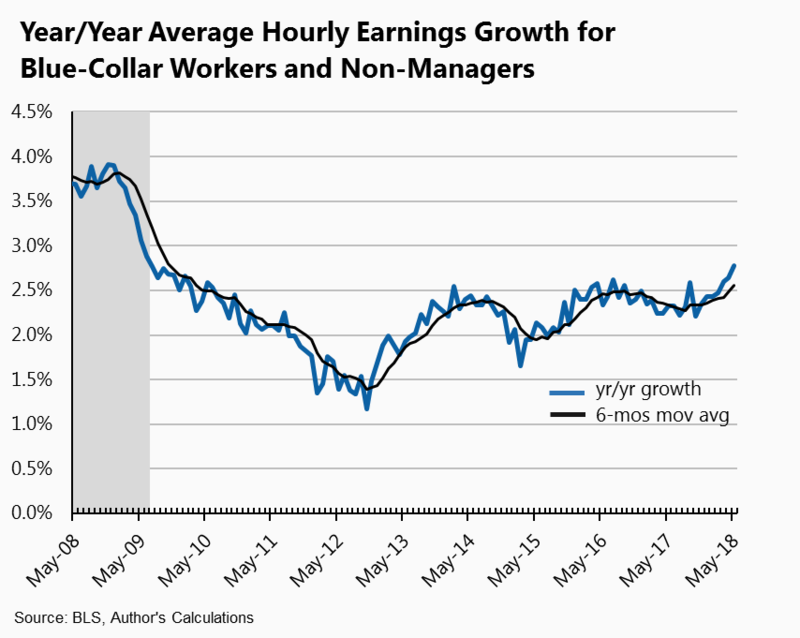 The figure below (which does not include this month’s data) shows the results of a simple statistical model that predicts the annual wage growth of non-supervisory workers (the one that grew 2.8 percent over the past year). I run the model through 2014 and then predict wage growth based on a slack variable and lagged wage growth. 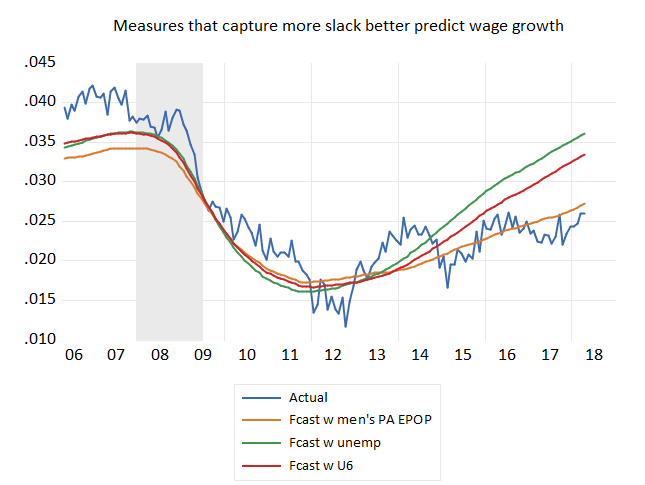 What it shows is that variables that are more inclusive of slack do a better job of predicting wage growth. The unemployment rate says wages should be growing about 3.5 percent right now. The more slack-inclusive underemployment rate (U6) is a little more pessimistic/realistic but the men’s prime-age employment rate, which shows the most slack, does the best. 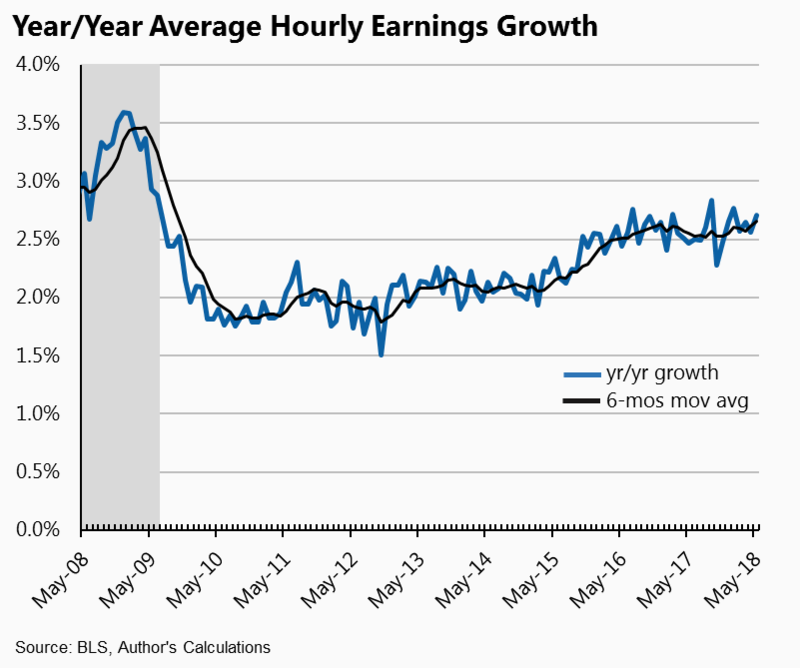 Share the post "May Jobs: Another solid month; Lowest black unemployment rate on record; Wage growth ticks up for mid-wage workers." 2 comments in reply to "May Jobs: Another solid month; Lowest black unemployment rate on record; Wage growth ticks up for mid-wage workers." In the past, unemployment rates of 3.8% would result in more significant wage increases. Might the current disconnect stem from retiring higher wage ‘baby boomers’ being replaced by younger lower paid workers? If so, it may be a explanation for this anomaly. Imports are irrelevant, price hikes on business from the runoff are the us problems from a useless “trade war”. Financial markets are in recession now with corporate bond crashing. This will slow corporate spending later this year.